Gary the Giraffe towers over the other tiny animals in the collection. He stands with an incredible posture, but with a kind of bewildered expression. A little fringing was used to make his tail, while the rest of him was made with basic quilling techniques. I did a little double up on his legs to give him a clear hoof. It also helped with his stability and made his legs that little bit longer. Gary stands at 7cm (2.8in) tall-most of that being his long neck. His body is made from 6mm strips, while his head and features are made from 3mm strips. This little Tinky fairy was inspired by my little sister, who for reasons totally unknown (or not remembered) has the nicknames 'Tinkerbell', 'Tinks' or 'Tilla'. Tinky was really fun to make: shaping her magical wings, cutting a classic Tinkerbell hairstyle, and shaping her groovy little fairy shoes. Getting her to stand unassisted took some patience, as every little part attached changed the overall balance. Finally, after some 'gentle' persuasion, she stands! I tried various ways of giving her some sort of face, but nothing came close to the sweet little fairy face she deserves- so her face is whatever you imagine it to be. Tinky stands at 9cm (3.5in) tall. Her dress was made using 6mm strips, while the rest of her was made with 3mm strips. 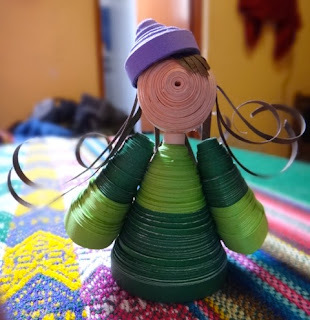 After a search through my favourite Quilling blogs and sites for a little inspiration, I landed on this little gem over at Inna's Creations. I fell in love and immediately set about cutting the strips I needed. Roughly following the instructions that Inna posted, I still had to figure out the best way of attaching the little feathers in a way that looked good. I now see why Inna used 1.5mm (1/16") strips for the feathers as it gives a more smoother look, and no doubt a lot easier to attach. Taking Inna's lead and using the fringing technique for the eyes, I am more than impressed with the results. It most certainly adds that something extra special, which makes these guys so cute! Loving so much how he turned out, I went about to make him a little brother. Although they are the same size, I think this one is younger as he is still waiting for his feathers to change colour. Both owls stand at 5cm (2 in) tall. The base of their bodies and eyes were made using 6mm strips, while the feathers, feet and beak were made with 3mm. Thankyou Inna for the inspiration! Enrique the Elephant is the first of the tiny animals in the Kurlikins collection (lots more to follow). He stands proudly and toots his trunk loudly. I've given Enrique plenty of ventilation in the ear department, as well as a cool colour contrast. Getting his trunk to stand up and out without tipping his body forward took a little bit of work. I got around this problem by placing his back legs a little further out to balance him. Enrique stands at 3cm (1.2in) tall and is made from 6mm strips. Stumbling upon this page on the Creative Quilled Creations site, I was immediately inspired to make this little sad dragon. Getting his tail to curl a little proved to be a little difficult, but we got there in the end. Making the arm and leg caps ended up being a great idea, as it made it a little easier to attach them to the body and gives him a more finished off look. I think he'd make a great friend to Jen's unicorns, horses and zebras. Sad dragon sits at 4.5 cm (1.8in) tall. His body, tail, and legs are made from 6mm strips, while his spines, front legs and caps are made using 3 mm strips. Froggy came about from having a nice stack of lovely green paper. I was experimenting a little with the back legs, and on the whole I'm pretty happy with the way they turned out. Putting the cover on the back of his eyes (my husband's idea) gives him a great googly look, and I hope I've given him the best chance at catching lunch with the nice, long curly tounge. Froggy sits at 4.5cm tall. He looks nice and chunky because he is made from mostly 6mm strips. The eyes, mouth, tounge are made from 3mm strips. 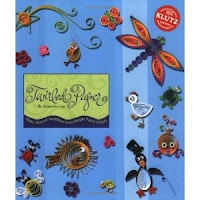 In the middle of 2011, the words 'Quilling', 'Filigree' or 'Paper Miniatures' were totally unknown to me. Although I had seen and admired cards that had been transformed with curled flowers and other beautiful shapes, I had never known there was a dedicated art behind it. Considering myself a less then creative person at the time, I would appreciate the quilled cards with a 'wow, that's impressive, but I could never do anything like that'- and move on to my next thought. I did however, have a love of paper: the colours, the textures, the versatility and always had always had a stash of paper hanging about. The problem was I never really had a clear goal as to what I could do with it all. I stumbled upon this great book: Twirled Paper by Jacqueline Lee. A fantastic beginners guide to the basic quilling shapes and possibilities of paper. Not being in an area where quilling strips or tools are readily supplied, I had to improvise. Cutting my own strips (badly) in my hurry to get started, and splitting a toothpick to use as a tool- I began curling paper. Once a few of the cutest projects had been made (with various levels of success), I started building on the shapes. Pushing, poking, and squeezing the paper into 3D forms, little characters with personalities began to emerge. I was hooked! 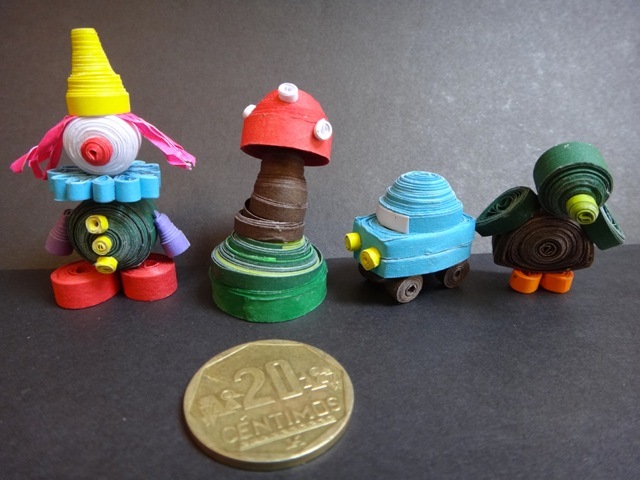 Here are my very first quilled 3D miniatures - with all their lopsidedness. So I gave one of her girls a go.... Nowhere near as fantastic, but...a start.